U.S. Hands Over Nation-Building Projects To Afghans : Parallels U.S. reconstruction teams have spent a decade building roads, bridges and other pieces of infrastructure that are badly needed in Afghanistan. But now the international effort is winding down, and it's not clear how much the Afghans will be able to do on their own. Afghan and U.S. officials attend the closing ceremony for the Paktia provincial reconstruction team on April 9 in eastern Afghanistan. NATO created more than 20 teams to help the Afghans rebuild. But now the U.S. teams are winding down their activities. 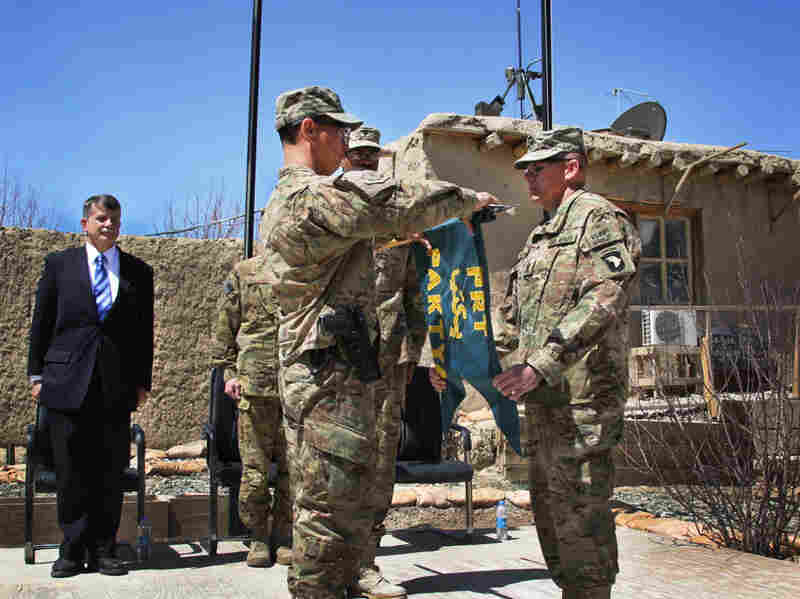 On a sunny spring day in eastern Afghanistan's Paktia province, Afghan officials and U.S. troops and civilians gather inside the ancient mud fort in the center of Forward Operating Base Gardez. They're attending a ceremony marking the formal end of the work of the provincial reconstruction team, or PRT. You stay too long and inadvertently you smother the capacity that you're trying to build up. As the international military presence in Afghanistan draws down, so too are these small units, which often consist of dozens of military personnel along with a few civilians. The teams have spent billions of dollars building schools and roads, and they've tried to help strengthen the capacity of Afghan local governance. The U.S. launched its first reconstruction team in Paktia in November 2002, just months after a major military operation aimed at clearing Taliban and al-Qaida militants from the area. It was a new twist on an old concept: nation building. 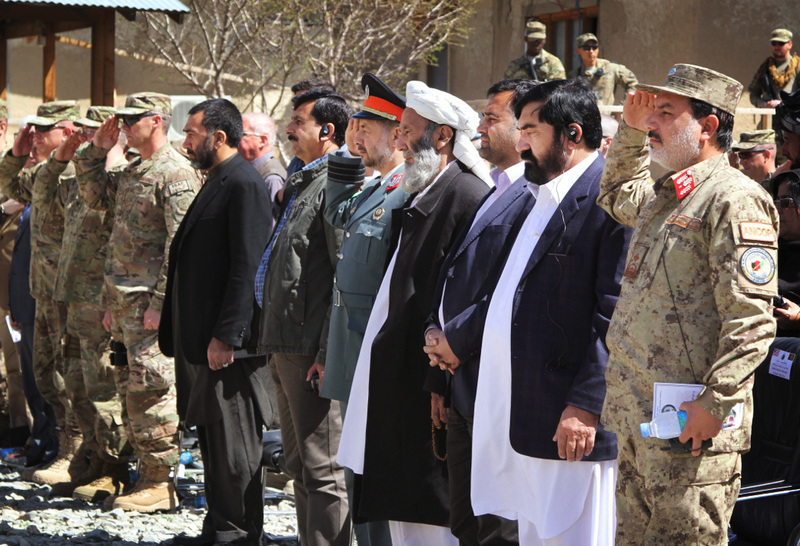 "This unique organization comprised of active Army, Air Force, Army National Guard, Army Reserve, U.S. government agencies, all work together to provide governance, security, economic assistance and reconstruction for Paktia province," says Capt. Eric Rauglas, who emceed the closing ceremony. The reconstruction teams were designed to build things the Afghans needed, promote security, and to win hearts and minds. And, as military units, the teams were designed to operate in areas too insecure for traditional development agencies to work. Over the years, the U.S. and its allies created 26 PRTs across Afghanistan. More than half remain in operation, but they will all be gone by the end of 2014, when the current NATO mission ends. "[They were] always designed to just buy time and space for our Afghan leaders to establish a strong and responsive government," says Air Force Lt. Col. John Chong, the last of 14 commanders to serve as head of the Paktia reconstruction team. Lt. Col. John Chong (left), the last commander of the Paktia PRT, rolls up and cases the flag at the closing ceremony on April 9. That high staff turnover is one of the major criticisms of the reconstruction efforts. But at the Gardez base on the day of the ceremony, everyone is singing the praises of the Paktia team. "The people of Paktia province will not forget the assistance they received," says Juma Khan Hamdard, the provincial governor. "The people will continue to have needs here. Before they asked the PRT for assistance, and now they will ask the provincial government." Will The Afghan Government Provide? Hamdard says he hopes the central government in Kabul will provide him with the financial support the reconstruction team once did so he can deliver projects and services now. Some of the attendees at the ceremony believe it will. But Jamila Yousefzai, with the Afghanistan Independent Human Rights Commission, isn't so sure. "We don't believe that the government will be able to deliver 100 percent of the services the PRT was doing," she says. But U.S. diplomat Stephen McFarland believes the Paktia provincial government is ready to stand on its own. "You stay too long and inadvertently you smother the capacity that you're trying to build up," he says. McFarland and others acknowledge it's been a struggle to find a balance between providing services the local governments couldn't, while not creating a culture of dependency on the reconstruction teams, who have access to vast amounts of money and the ability to make things happen quickly. The Paktia team has spent more than $280 million in its time on the ground. "The presence of PRTs and a lot of international advisers, and a high dependence on them, it kind of made the provincial administrations a little bit lazy," says Hamid Afghan, who manages PRT transition issues for the Afghan government. "Even simple works, they were relying on PRTs," he says. At times through the years, the reconstruction teams have come in for criticism from Afghan officials, including President Hamid Karzai, who decried what he termed a parallel structure that was working on projects without coordinating with his government. That was a result of an early culture of doing so-called quick-impact projects designed to win hearts and minds, says Afghan, the government official. That approach led to countless poorly planned and constructed projects that have been abandoned. He cites a project in Badakhshan province, where a new bridge was built — with no road access. And some of the work by Afghan subcontractors was so shoddy that it had to be knocked down and restarted. Tales of the money wasted in the process of contracting and subcontracting are legendary. Clare Lockhart, author of Fixing Failed States, says that several years ago there was a sea change in the approach. "Where they've worked, they really have been geared to supporting and building Afghan governance," she says. 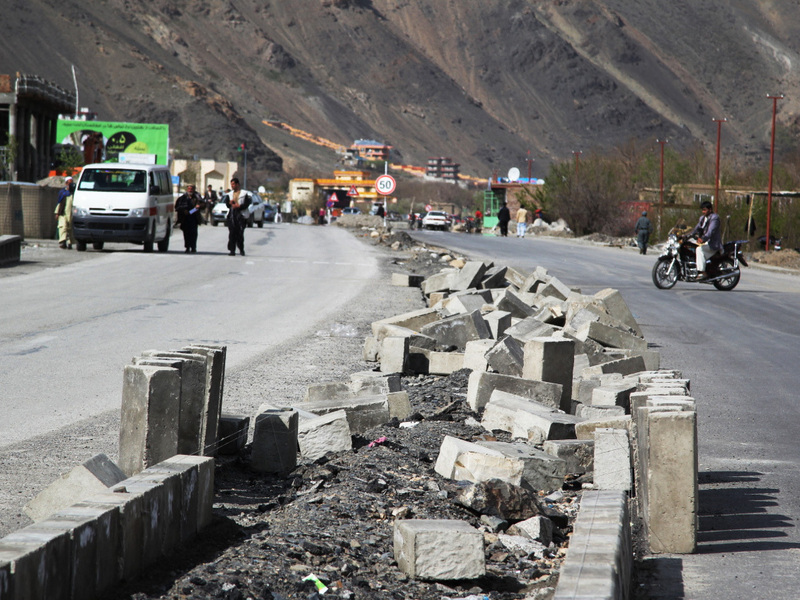 The main road through the Panjshir Valley, shown here April 9, remains under construction. A U.S. reconstruction team started the project in northern Afghanistan, and the provincial government is overseeing the completion. The teams began to tailor projects to Afghan needs. And they began to focus more on strengthening the capacity of provincial governments. But, Lockhart adds, that capacity still varies enormously across the country. As a result, some provinces are more likely than others to be able to complete the many unfinished projects being handed over to them as the reconstruction teams leave. It's too soon to tell if the Paktia government can stand on its own. But other teams have been closed long enough to judge their legacy. The Panjshir Valley is a few hours' drive north of Kabul. It's one of the most scenic places in Afghanistan. And it's also one of the safest. Standing in a valley, Mohammed Tahir, head of technical services for Panjshir province, points to all the surrounding projects. There are wind turbines on top of one of the peaks. The road we're standing on, still under construction, was another project. Many of the government buildings were constructed by the U.S.-run Panjshir reconstruction team, which left in the summer of 2011. Tahir says that the team provided money and technical expertise, but Afghan contractors did the work, and they are still working on projects here. He admits the quality of the work is uneven, but he believes the government will have no problems completing the projects. However, some Panjshir residents weren't so sure. "Americans were doing a good job in terms of construction, but the work slowed down when the local authorities took over the projects," says 25-year-old Haji Ahadmir, who works as a driver. "The work on important projects like building schools and roads has stopped now." A number of people said the central government isn't providing the support to Panjshir that the reconstruction team did. That's where Afghan and Western officials say the real problem lies: For the foreseeable future, Kabul won't have the resources to make up for the drop in reconstruction team spending. And that could undermine provincial governments as they try to stand on their own.